Chris Bryant could see the headlines. Sitting on his hospital bed before undergoing surgery to remove a cancerous growth, the Labour MP knew he had to get the word out that he wasn’t leaving his party. Seven of his colleagues had jumped ship to form The Independent Group, now known as Change UK. Bryant was one of the names rumoured to have been considering joining them. In reality, he was going nowhere. But as doctors contemplated whether to use a local or general anaesthetic, he knew that radio silence on his part would only fuel the speculation. ‘Chris Bryant wasn’t available for comment’ wasn’t the message he was trying to convey. The prognosis for Bryant, however, is positive. There is nothing in his lymph nodes, and various MRI scans and ultrasounds have been all clear. “With any luck, we’ve managed to catch it just in the nick of the time.” A skin graft has left him with a plaster on the back of his head, which SNP MP Dr Philippa Whitford jokingly refers to as a “sympathy patch”. There are at least two other MPs with the same condition, Bryant says, but given the visibility of his own, he felt had to go public. His interview with Kay Burley on Sky News saw a large outpouring of support, including from some unlikely corners. Michael Gove was the first to text Bryant. Chris Grayling even gave him a hug, which was a “bit disturbing”, Bryant quips. Others have provided plenty of gallows humour. The Welshman, who was born in Cardiff, believes those who work in Westminster need a bit of a “cwtch” – a hug to the uninitiated. As the second person to put themselves forward to succeed John Bercow as Speaker, he believes he’s the person to provide it. Bryant was born in 1962 to a Scottish mother and a Welsh father. His mother used to do make up for the BBC, and even worked on Shirley Bassey’s wigs (“It’s absolutely shocking that I ended up being gay”). Bryant informed the famous Welsh singer of this fact when they met years later. Bassey shot back: ‘Do you think you should mention wigs to an octogenarian?’ “That was the end of the conversation, so I think I completely buggered that up. All I wanted was a selfie,” Bryant recalls. His family moved to Bilbao when Bryant was seven years old. At age 10, they moved to Madrid after his dad took on a job as head of IT for Chrysler in Europe. He still speaks Spanish to this day, and often does media in Argentina and Spain. On his 13th birthday, his mother perched on the end of his bed. She told him that she had a drinking problem. “The next eight years she had a steady decline through alcoholism. I poured away, it must be hundreds of bottles of vodka, whenever we found them,” Bryant says. After graduating with a degree in English, he obtained a degree in theology. He was ordained in 1986 by the former Bishop of Oxford, Richard Harries, whose son is now his oncologist. Bryant became a priest in 1987. While at Oxford, he joined the university’s Conservative Association. He did so after being lobbied by a friend who wanted to defeat William Hague – who he says was a “right-wing ideologue” and an “anti-European” – in the race to become president of the association. Bryant was also a precocious talent on the stage. He’d been a member of the national youth theatre alongside Daniel Craig, with whom he once holidayed. Ahead of a university production of The Threepenny Opera, he admonished the director, who had touched a nerve by offering singing advice. “You’re the worst director I’ve ever worked with,” he barked. “I’ve been in hundreds of shows and I’ve never known anybody so disorganised. You know nothing about theatre, you know nothing about music. Get out of my dressing room.” The director, Ian Bostridge, is now considered one of Britain’s greatest tenors. Bryant’s journey to the Labour party began at theological college. A placement in Newcastle was followed by overseas trips. He spent three months in a shanty town in Lima, and six months in Buenos Aires. He was thrown out of Chile for taking part in the funeral of a young man who had been set on fire by the police under Augusto Pinochet. He returned to the UK with tear gas cannisters with ‘made in the UK’ labelling. He contacted three people, Tory minister Chris Patten, the Lib Dem’s Simon Hughes and Labour’s George Foulkes about what he had found. Only Foulkes responded with an invite to meet. The sale of tear gas to the South American country was later stopped. “That’s when I joined the Labour party,” he says. By this point, Bryant was unsure he could reconcile his job with his sexuality, which he had begun to acknowledge after a girlfriend told him he was homosexual. Before he turned 30, he left the priesthood for good. During the 1990s, Bryant wrote biographies of Glenda Jackson and Stafford Cripps, the first of many books. He worked at the BBC as head of European Affairs after losing out in the 1997 election in the Wycombe constituency. In 2001, he was elected as Labour MP for the Rhondda. Clippings of Bryant’s early years make for uncomfortable reading. Bryant says that one of the newspaper headlines when he was selected as a candidate in his constituency was “how pink was my valley”. In 2003, he was ridiculed for posting a picture of himself wearing underpants on a gay dating side called, Gaydar. “Things have changed very dramatically in a very short period of time. You’ve got to remember that in 2001, it was still illegal in this country as a gay man to meet somebody in a bar and take them home… It was only made legal 2003. It was not as liberal in any sense as it is today. Everybody forgets what a dramatic difference being able to say the words ‘my husband’ has in terms of social acceptance,” he says. Bryant was also targeted for being overly ambitious and cosying up to the Labour leadership. A tough square to circle, given he was one of 15 backbenchers calling for Tony Blair to resign as prime minister in 2006. “If I made a big mistake early on, it was seeking too much airtime. It’s easy to get airtime if you want. Oddly, it was even easier if you were gay. You just had to say something flamboyant and suddenly you were on Newsnight. That world has kind of changed,” he says. 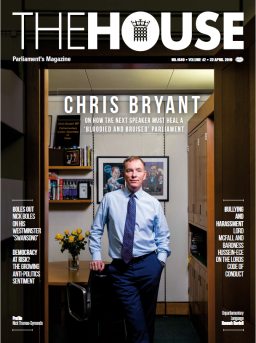 Bryant’s first frontbench role came as deputy leader of the house in October 2008 (he later served as shadow leader between 2015 and 2016, after a short period covering the culture brief). He also served as a Foreign Office minister until the 2010 election and held numerous positions under Ed Miliband. As a backbencher, Bryant became known for his work on the phone hacking scandal (he himself was hacked) and his criticism of Vladimir Putin’s Russia. Bryant, who has written a two-volume history of parliament, reckons someone will have to pick up the pieces of the procedural wreckage left behind by Brexit when the debate, eventually, moves onto the next phase. He advocates a Speaker’s Conference, which would need to be tabled by the Government, to go over all the outstanding issues. “We’ve set hundreds of precedents in the last two years. Normally, if the Government hasn’t got a majority, it hasn’t got a majority on committees. They’ve changed that. Normally, a session is a year… we’ve gone on for two years and I wouldn’t be surprised if we go on for a third at the rate we’re going. Normally, you have opposition days once a month. We haven’t had one since November. Normally, forthwith means forthwith and not with another vote in between. Things that are unamendable that have suddenly become amendable,” he says. While personally not in favour of full electronic voting (he enjoys the drama of the tellers revealing the numbers and huddling through the lobbies), he says it would be decided collectively, rather than from the Chair. His pitch for the Speakership is three-fold. Shaped by the memory of former chair Michael Martin admonishing a woman MP for reading a question out in the Commons, Bryant says: “I will do everything in my power not to belittle or diminish or lecture MPs from the Chair, but, insofar as it is possible, to respect every person.” Secondly, Bryant pledges to be an authoritative but “pleasant” voice that commands respect, one who listens to the clerks but is not always driven by their views. And lastly, as chair of the finance committee and having been closely involved with the restoration and renewal plans for the Palace of Westminster, he says he is well placed to ensure money is well spent. As for refreshing the culture of the Commons, Bryant would like to hold an annual event in January for the staff who work in the building, with MPs serving. On a similar theme, he wants to make Speaker’s House “more welcoming” and use it for hosting international guests, alongside events for MPs’ spouses. Despite his own chipper attitude, Bryant recognises the strain that many people in Westminster are under. When things eventually die down, he wants to play his role in lifting the collective spirit of Parliament.